On Friday December 10, 2010, Aaron and Kay Epp, and Darryl and Lind DeCamp travelled to Amarillo with all of the items donated by the generous people of the Liberal and surrounding area. For the past couple of months the Liberal American Legion and American Legion Auxillary have been conducting a ? ?Holiday Drive ? for the veterans at the Thomas Creek Nursing Home and VA Hospital in Amarillo Texas. They had been collecting clothing items of, sleep pants, shirts, house shoes, and socks. The had also collected toiletry items like, soaps, shampoos, toothbrushes, toothpaste, razors, combs and brushes. Monetary donations were also received. The studios of KSCB and The Legend along with Aaron Epp Auto repair were drop of points for all the donations. 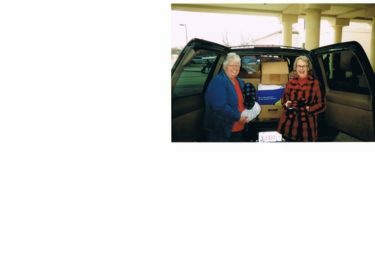 According to Kay Epp and Linda DeCamp, organizers for the drive, The Thomas Creek staff were overwhelmed with the generousity of the community as several staff members and even patients in the waiting room came out to help unload all the boxes. Students at Cottonwood Intermediate School also got involved, hand making 140 Christmas Cards for the veterans which were delivered on Friday and were very special to the Veterans. Epp and DeCamp had also purchased special gift items for the women at Thomas Creek. The staff at the VA hospital were amazed at the items delivered and assured Kay and Linda that the veterans were now going to have a very Merry Christmas. Kay Epp was also a guest on “Live From Broadcast Square” on Monday to share the good news and to thank everyone who donated. She also announced that The American Legion Auxillary would collect donations year-round with drop off points being Aaron Epp Auto Repai and the studio’s of KSCB and The Legend.